Pancakes don’t just have to be eaten on ‘Pancake Day’. People generally eat pancakes on Shrove Tuesday, which falls one week before Ash Wednesday (this marks the first day of Lent for Christians), but they can be enjoyed throughout the year. Whether you fancy a quick snack or you want to make something different, pancakes offer a cheap and simple meal. 1. Sieve the plain flour into a bowl and remove of any large lumps. Add the eggs and the milk to the bowl and mix together well. This becomes your batter mix. 2.Add a splash of cooking oil or a small knob of butter to a frying pan once the pan is hot. Swirl this around so that the base of the pan is covered – this will help to keep the pancake mix from sticking. Gently pour your batter into the pan until the base is lightly covered, remembering that thin pancakes are lighter and crispier (and the mix goes further). 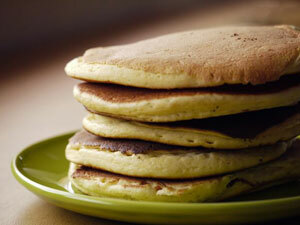 3.Cook the pancakes for up to two minutes, but flip the pancakes over to stop them from burning. Once they are a golden-brown colour, they are ready to eat. 4. Serve with lemon and sugar for the basic pancake experience, or even add jam to your pancakes.